This chapter is posted as part of an annotathon in partnership with Marginal Syllabus, using the Hypothes.is annotation tool. Storytelling and Surveillance: The Precarious Public of American Muslim Youth is Chapter 4 of By Any Media Necessary published by New York University Press, May 2016. Used with permission. is like the heart of [our] youth group I think. What is the heart of every teenager’s life? Our youth group does cater to teenagers. So we have a Facebook page.… Some of them [the youth] do not come to youth group anymore, but there are some that can still be in touch with this youth group or there are just kids who have necessarily lived farther away, but they can still know what is going on in the community. In 2012, MYG discussions often involved media, as the youth discussed news, watched online videos, debated anti-Muslim perspectives, and accessed religious websites during the session. Both MPAC and MYG were founded through the ICSC, and MPAC staff are closely involved with the programs run by the youth group, whose members in turn help out with MPAC events. Both organizations attribute their ideological underpinnings to Dr. Meher Hathout, a recently deceased physician of Egyptian descent and one of the Islamic Center’s founders. Like Dr. Hathout, MPAC and MYG strongly assert that American Muslims need to accept being American as much as they claim their religious beliefs. In Dr. Hathout’s words, “Home is not where my grandparents are buried; it is where my grandchildren will live.” In the course of Shresthova’s research, she interviewed 30 young people involved with MYG and MPAC activities who came from a range of ethnic backgrounds, including Arab American, South Asian American (Pakistani and Indian), and African American. She attended MYG’s weekly meetings for six months, participated in three MPAC Young Leader Summits in New York, Los Angeles, and Washington, D.C., during the summer of 2012, and conducted 15 expert interviews with American Muslim youth community leaders. Shresthova also connected to American Muslim youth networks online to explore how new media complements, and expands upon, face-to-face encounters. A lot of Muslims, in general, live in a state of fear....Then other people are like, “What are you afraid of?” It just leads to more uncomfortableness and people not being able to relate to each other. Maira (2003) proposes that such civic engagement may take several forms, including “greater involvement in electoral politics,” “progressive activism and grassroots politics,” and “outreach to non-Muslim communities.” We find that American Muslims take “action” through an even broader range of activities, many of them situated on the cultural end of the spectrum of participatory politics. Young American Muslims use social media to establish and maintain networks. They turn to their networks to share stories they create and appropriate. At times, they also mobilize these networks to achieve civic goals. “Precarious publics” may be the right theoretical frame in which to understand this emergent American Muslim movement. We defined a precarious public as “one where there is a considerable gap between voice and influence.” In such circumstances, youth have to weigh the perceived benefits of participation against the obstacles and possible risks. Our notion of precariousness owes much to Mary Gray’s (2009) research on queer and LGBT youth in rural America. Gray harnesses Jurgen Habermas’s seminal theorization of the “bourgeois public sphere” as an autonomous space where public opinion can be formed. She also incorporates feminist scholarly critiques of a universalized public sphere. In particular, Gray builds on Nancy Fraser and Michael Warner, who pointedly demonstrated that Habermas’s conceptualization overlooked the existence of multiple (counter)publics that have been and will continue to be sites of contention that blur boundaries between what is private and what is public. Extending those critiques, she proposes the notion of “boundary publics,” which she defines as “iterative, ephemeral experiences of belonging that circulate across the outskirts and through the center(s) of a more recognized and validated public sphere” (92–93). Through her ethnography of the Highlight Pride Alliance (another HPA), Gray argues “boundary publics” reveal “a complex web of relations that is always playing out the politics and negotiations of identity” (93). As such, they are “at once within and just beyond the reach of conservative elites attempts to” claim control. Boundary publics, according to Gray, manifest both in everyday face-to-face and online spaces. She recounts the HPA youth “performing drag” in the Springhaven, Kentucky, Walmart, the only business that stays “open 24 hours within an 80-mile radius,” as a “rite of passage for those entering the local gay scene” (97). At the same time, she describes an incident at the Walmart where the youth were slandered by a hostile and verbally aggressive peer to the point that they had to leave the store. The rural youth described in Gray’s study encountered analogous “opportunities and challenges” online. She finds the internet gave them access to experiences unavailable “in their daily life,” but it also brought “risk of exposure” (127–130). As a consequence, they found themselves putting up or removing online content depending on the emotional and political climate in their geographically local communities. Gray’s “boundary publics” are crucial to our analysis of American Muslim networks as precarious publics; her analysis helps us to identify similarities between the conditions faced by American Muslim youth and rural LGBT youth, despite crucial differences in the lived experiences of these communities and networks. For the rural queer youth in Gray’s study, “authorized access to public space is fragile” (94–95). The same can be said for American Muslim youth, who struggle to find spaces to connect with other like-minded youth. Whether they are face-to-face or online, these spaces are crucially important to both communities. For the LGBT youth, shutting down such gathering places threatens their emergent community’s existence. American Muslim youth negotiate very similar circumstances. On one hand, American Muslim youth recognize the potential of new media to connect to others. They value the open conversations they conduct through these networks. They nourish these connections by creating and circulating media—literally working through “any media” available. At the same time, they weigh these opportunities against the possibility that online expression may attract unwelcome scrutiny, placing them at risk. During the course of our research, the pendulum on these considerations shifted several times in response to current events. 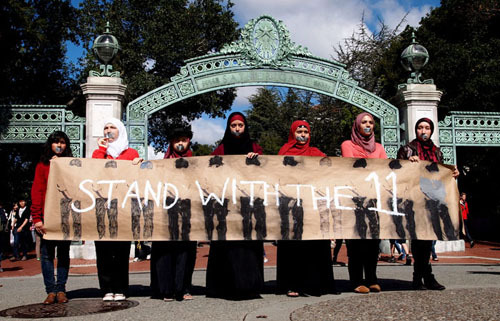 For example, we witnessed how the youth decreased their activities when the Associated Press released a Pulitzer Prize–winning report revealing that the New York Police Department authorized and executed widespread surveillance of American Muslim communities and organizations (including campus-based Muslim student associations) in the tri-state area. We saw the pendulum swing the other way when storytelling projects (like 30 Mosques) by young American Muslims inspired the youth in our study to also find ways to communicate about their experiences. Such shifts indicate these post-9/11 networks are indeed “precarious,” as young people weigh concerns around what information, perspectives, and experiences they can (and should) share with others. Some things that might be expressed in an enclosed space become more risky when subject to context collapse. Understanding how young people resolve such issues is key to understanding which youth can deploy the public communication channels that Kahne et al. (2014) see as integral to participatory politics. In Democracy Remixed, which focuses on the political lives of “young black people,” Cathy Cohen (2010) highlights both “structure and agency” as crucial dimensions that determine the choices and circumstances of young people’s (political) lives (11). As she reflects on the surveys and interviews she conducted with black youth, Cohen observes that “the importance of structure in shaping their lives was undeniable, but they never let me discount the control they had over their own lives, however limited” (13). Similarly, the young American Muslims we interviewed shared their determination to navigate expression in a climate where the odds are often stacked against them. The media these youth created, the networks they fostered, and concerns they articulated have much to teach us about both the opportunities and challenges of participatory politics for an emergent, marginalized American Muslim youth community. For example, American Muslim youth efforts highlight that the ability to contribute to and shape narrative is crucial to the construction of shared identities. These activities also show that access to social networking platforms and media sharing practices is helping to shift control over the construction and circulation of political identities from the few to the many. Much as Cathy Cohen sees black youth “holding a precarious position within our nation” (13), we find that American Muslim youth engagement with participatory politics is fragile, yet significant. The discussion of young American Muslims in this chapter also connects to the obstacles and challenges faced by undocumented youth involved in the DREAM movement discussed in Chapter 5. Anonymity [online] helps because you can have a more open conversation than you would have if you knew this was a person who was part of an institution....In that sense, you can have those uncomfortable conversations that you can’t have within an MSA or a mosque, where it may cause reactions and people may get offended and leave. The institutions...(the mosque and the MSA and the national organizations...) have a lot of baggage (cultural, sectarian and ideological). The [American Muslim] community is very fragmented as a result of it. For people who want to get work done, going through institutions is very problematic on certain issues....[For a] very quick response and grassroots organizing, I find it very tempting to resort to new media. The circulation of media becomes the life force of these new media networks. 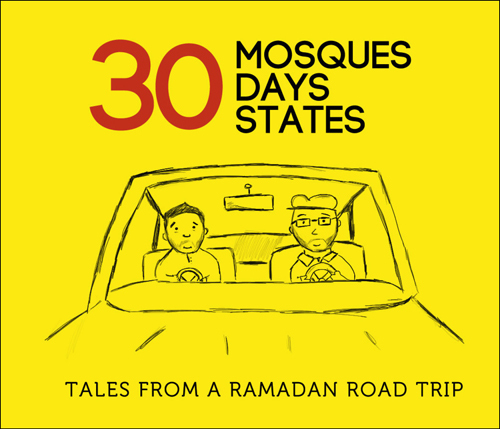 In 2009, Bassam Tariq and Aman Ali (the author of this chapter’s opening quote), two young American Muslims with a shared faith and curiosity, embarked on a storytelling adventure they called the 30 Mosques project. They visited different mosques in New York City during each night of Ramadan and blogged about their experiences at 30mosques.com. Their journey took them to various parts of the city—from the Masjid Khalifah established by Malcolm X and other Nation of Islam members over 50 years ago in Brooklyn’s Bedford-Stuyvesant neighborhood to the recently opened Harlem Islamic Center. Their narratives ranged from the everyday, as they documented what food they ate, to the poignant, as they stood outside a mosque that had burned down due to faulty electrical wiring. As the Ramadan stories accumulated, there emerged a more diverse picture of Muslim experience in New York City. Their blog readership skyrocketed as their stories circulated through social media networks, with the most popular posts receiving more than 9,000 comments. Before Ramadan ended, 30 Mosques had been featured on NPR twice. The stories Ali and Tariq collected contributed to, and also inspired others to join, a growing but dispersed storytelling movement that seeks to counter stereotyped perceptions through the circulation of narratives about the lived experiences of diverse groups of American Muslims. The future of Islam in America has to be written by Muslim Americans who boldly grab hold of the conch and become heroes of our own narratives. We can no longer exist in culturally isolated cocoons or bury our heads under the sand waiting for the tide to subside on its own. We must follow the traditions and values of Islam and America by being generous and inviting with our narratives. We must tell stories that are “by us, for everyone,” thus accurately reflecting the spectrum of shared common values that exist simultaneously within the Muslim and American spirit. I think it’s time to tell the story of Muslim-Americans....You should be confident enough in your Muslim identity [that]...it should be like, “I’m a filmmaker. I love politics and I’m a Muslim as well...” I think that type of integration needs to start happening within the stories that we tell. Well, it’s just a natural progression.… In 2009, it was just a very local venture around New York City. And then it became a cross-country thing in 2010 and 2011. And now it kind of transcends them to become more of a global and more of a virtual kind of project and that’s just naturally where it’s been going. As more and more people around the world are hearing about it and inspired to do things. MYG’s Breakfast@Night (which later became BF@N) also went through several iterations. In 2011, the project was mostly run over Facebook, as the organizers sent out a call for photographs documenting people’s experience of Ramadan through their social media networks. The number of submissions overwhelmed the team. Jihad Turk recalls that news of the project “spread by word of mouth and within two weeks, the site not only got thousands of hits, but American Muslim youth were contributing their own photos from around the country with dozens of states and hundreds of cities being represented.” For their second year, the BF@N organizers took a different approach. They built a separate website rather than using Facebook. The breakfastatnight.com homepage welcomed visitors to “the one and only Ramadan photo project powered by YOU.” The team expanded the call for submissions to include other media content. They also launched the BF@N blog, where a team of bloggers, including MYG youth, shared their Ramadan thoughts and experiences. While diverse in their geographical scope, the other projects inspired by 30 Mosques shared similar goals and methods—all, for instance, used new media to collect and exchange stories of Muslims during the month of Ramadan. These Ramadan storytelling projects endeavored to present a more positive, human, and peaceful image of contemporary Islam, an important message for many American Muslim youth. In various ways, the projects also relied on new media. Aman Ali admits that without new media, “we just don’t even have a project.” Certainly, some of the projects, like the Hijabi Monologues and Love, InshAllah did not depend exclusively on new media, using live performance and print books, respectively. They did, however, benefit from new media in increasing their reach as the editors and directors turned to Facebook and other social media to recruit contributors and circulate what they created. Crucially, these storytelling projects highlight how, as we have described, American Muslim youth identities are always already political and not simply cultural, as young people seek to define themselves as explicitly both American and Muslim in the context of the post-9/11 world. The significance of these tensions was brought into sharp focus in the days that followed the Boston Marathon bombings in April 2013. As investigators uncovered evidence that the Tsarnaev brothers had used the internet to access materials that supported their shift toward extremism, the debates around “online radicalization” intensified. For example, in an article published by the New York Times on April 23 (Cooper et al. 2013), “federal authorities” were said to have speculated that the brothers were “angry and alienated young men, apparently self-trained and unaffiliated with any particular terrorist group, able to use the Internet to learn their lethal craft.” Similar statements were made during a debate—“Mining Online for What May Have Radicalized, Informed Tsarnaev Brothers” (2013)—televised on PBS the following day. During this discussion, Dr. Jerrold Post of George Washington University observed that “the phenomenon of radicalization online is really quite alarming. It’s been estimated that there’s some 4,800 radical Islamist websites. And I am struck that young women and men who are isolated, not feeling they belong, in this way, can belong to a virtual community of hatred.” Responding to the spread of such views, MPAC and the New Media Foundation organized a forum titled “Online Radicalization: Myths and Realities” in Washington, D.C., on May 28, 2013. During this session, one of the panelists, New America Foundation fellow Rabia Chaudry, identified “narrative” as the key to understanding and countering online radicalization. She described how the “You cannot be a good American and a good Muslim” narrative, ironically propagated both by Muslim extremists and anti-Islam advocates, fostered feelings of alienation among American Muslim youth. To counter this, she asked “Western Muslim communities to step up and become engaged and become partners in bringing their voices online to counter these narratives.” While Chaudry’s statements certainly situate narrative and storytelling as an important component of America’s counterterrorism efforts, they also make clear the enormous challenges American Muslim youth face in defining their own terms of engagement through participatory politics. In fact, examining Chaudry’s statements from the youth perspective returns us to the notion of “precariousness” raised earlier in this chapter as we pivot our attention to how such projects remain vulnerable to uninvited scrutiny. Being a Muslim in America is not easy at all. There are a lot of uncertainties about our role in American narratives because of 9/11....I think this is an issue for people, for Muslims in our community, whose civil liberties are being completely pillaged. You know there are people held without...whatever, I don’t want to get into that too much. I wasn’t quite sure what to expect as I headed to the church that morning, but I guessed I might run into a few protesters there. Sure enough, they were there to greet me when I arrived. Just outside the front doors stood several men holding signs that insulted the Prophet Muhammad (PBUH). They had planted themselves there several hours prior to the start of the convention and were making it quite clear that they were vehemently opposed to Islam and any Christians who associated with its followers. If somebody sends you a message on YouTube attacking you, saying you are the worst representation of Islam, like you are a poor excuse for a hijabi—what do you know about that, really? I don’t see you having the courage to get up on YouTube and talk about Islam, because that is a huge thing in itself. Especially being our age, that we are, in our teenage pre-adultish years, you won’t see many people on YouTube starting that early....I can see why some people would leave Islam because they are so afraid of the Muslims, of the Muslim critics in this community. Criticism of the HijabiBengaliSisters escalated in April 2013, when someone used the alias Nashiha Monika to create “The Truth about Hijabibengalisisters” Facebook page dedicated to disparaging them. The page featured photographs that the sisters had posted on their own Facebook page and comments like “The sisters would have you believe their fame is knowledge. But having over ten thousand followers or a million followers dose [sic] not mean you are knowledgeable. FAME IS NOT KNOWLEDGE.” The experience of the HijabiBengaliSisters highlights the burden of representation some American Muslim youth bear as they become more publicly visible online. While some, like Mo and Nash, desire to positively “represent” Islam and Muslims, not all youth share this desire, particularly given the harsh criticism to which those with a public presence are often subjected from both within and outside their communities. Selina explained that though her “faith is a big part” of her environmental activism, this is not something she wants to “tell the outside world.” Clearly, privacy and surveillance are urgent concerns for American Muslim youth. They are aware that their communities top the lists of domestic national security concerns. At the same time, these youth worry about privacy more broadly defined. They are concerned about being judged by other Muslims. They also worry about being bullied by “haters.” Much like the youth in Boyd and Marwick’s (2011) study who care about privacy, but with the additional burdens of being Muslim post-9/11, the American Muslim youth negotiate privacy and surveillance concerns alongside their efforts to engage with others within infrastructures they cannot fully control. I sometimes send emails to my friends saying, “Hello NSA” (even in my texts), because I think appreciating the dark humor of it all makes it go down a bit easier and it’s a little bit more cathartic. But also it keeps you on your toes to be smarter about how you frame that content. lol, I love the humor … but what I really hate is when muslims get such dirty looks when in public.… I have received similar looks when I wear my koufi in public and people seem to pay me no mind when i go into the same exact store with a fitted cap on. Reflecting on the Lowe’s controversy, Dilshad Ali (2011), a prominent American Muslim journalist, observes that the decision to withdraw advertising “unwittingly inspired a sudden grassroots coalition … dedicated to defending American values and fighting back against hate.” The second example is the social media campaign that coalesced in response to the Newsweek cover article “Muslim Rage,” written by Ayaan Hirsi Ali (2012), an openly atheist Somali Dutch activist and Islam skeptic. In the article, Ali reflected on the violence in Libya that had culminated in the killing of the ambassador and three other staff members at the American embassy in 2012. She argued against sympathy for post-Gaddafi Libyans because they had made a “choice to reject freedom as the West understands it.” Though the article inspired an often heated debate, the most visible reaction played out on Twitter when Newsweek invited readers to discuss the article under the #MuslimRage hashtag. Soon, the social media platform buzzed with humorous tweets that both questioned Ali’s argument and poked fun at the hashtag. For example, Hend commented on the fact that no one notices her hair, because she wears a headscarf, while Hijabi Girl playfully mused on the multiple meanings of Jihad: [caption id="attachment_12174" align="aligncenter" width="500"] Tweets from Hijabi Girl and Hend. [/caption] At last count, Hijabi Girl’s one-liner had been retweeted 2,198 times. Many of the #MuslimRage posts explicitly challenged widespread stereotypes about Muslims and Islam, illustrating the creative and civic potential of such networked responses. The Islam I grew up with in America is not the Islam my children are experiencing. The possibilities for their lives are much more expansive than the possibilities for my life were. The largely comfortable integration and success of American Muslims that sets them apart from their counterparts in Europe also lends space for these possibilities. From tremendously increased participation in American civic and cultural life, to pressing internal demands on religious orthodoxy, another generation or two will see a vastly different American Islam that will likely have an impact on Muslims globally. From marginalized minority, American Muslims are poised to become mainstream leaders and influencers. And it’s no small irony that while historians bemoan conquest and Western colonialism as the death knell for Islam’s “Golden Age,” this new Muslim renaissance is growing out of the West itself. In an article published in Time on April 16, 2014, Rabia Chaudry gave a decidedly positive assessment of the current situation of Muslims living in United States. As she pointed to the significant role that American Muslims play in important current debates around issues like homosexuality and Islam, Chaudry boldly concluded that not only is their situation more stable than it was a decade ago, it is leading towards what she envisions as “a Muslim Renaissance” as American Muslims revisit, contest, or revise religious tenets that no longer serve their needs. Her celebratory tone suggested that American Muslims may now be moving beyond precariousness. Is this really the case? Will the expressive projects described across this chapter eventually transform how their fellow Americans think about these youth and embrace them for their active contributions to participatory politics? Reflecting on our research, the American Muslim youth we encountered were struggling to balance the benefits and risks of public expression. Determined to tell their stories and challenge existing stereotypes, they have turned to new media platforms and practices as a means to circumvent perceived roadblocks. As traditional advocacy organizations have sought to censor open discussions within the physical space of their local mosques, the youth have sometimes moved these discussions online, forging a potentially supportive peer-to-peer network. As stereotyped portrayals of Islam obstruct the development of a diverse and realistic understanding of their actual lives, American Muslim youth have used digital media tools to collect and share more authentic stories. As concerns over government surveillance have grown, the youth have harnessed humor to acknowledge and ultimately alleviate some of the resulting strain. As more conservative Muslims have slammed young American Muslims for transgressing Islamic norms, the youth have sometimes turned to each other for support. Sometimes. At other times, the youth have withdrawn and chosen silence as their supportive networks faltered under pressure. Many of the American Muslim youth we interviewed and observed saw new media as crucial tools for exploring issues, expressing their experiences, and connecting with others. They also possessed a heightened awareness of the risks of uninvited scrutiny and surveillance. During our research, we saw the youth networks that connected them teeter several times in response to particular events, which mostly occurred outside the young people’s immediate vicinity. For example, many youth went completely silent in the aftermath of the Boston bombings as public discourse turned to “online radicalization.” Such networks are thus fragile and precarious, but we might also describe them as liminal and elusive, providing means of escaping the constraints imposed on these youth by various adult authorities. Many of these expressive projects originated outside institutional contexts as formal organizations like MPAC and ICSC played more of a supportive rather than leadership role in their creation and circulation. For many of the youth included in our study, living in a post-9/11 United States has been defined, at least in part, by their struggles with (and against) antiterrorist security measures. As being a Muslim was perceived as a threat, they had to rally to defend and define their own cultural and spiritual identities while combatting racial profiling and heightened scrutiny. In this context, circulating stories, creating media, acknowledging surveillance, and leveraging humor become crucial practices for an emergent American Muslim counterpublic. As we will see in Chapter 5, the production of “coming out” videos has played a similar role for the DREAMers, undocumented youth struggling for the right to stay in this country and get an education. There, we will get deeper into the affective and psychological consequences of being able to voice your own experiences, as well as the tactical advantages this activist network gained by being able to tap the affordances of social media and participatory culture. The full text of By Any Media Necessary: The New Youth Activism is available online at NYU Press.